With the yellow colorway attracting a hoard of rowdy sneakerheads at Complex Con, it’s safe to say that the recent trio of Diamond Dunks is one of the most anticipated releases of the year. Paying homage to the original in a much more subtle way, the collaboration will feature the same crocodile and leather materials with quite an interesting modification: a silver removable swoosh that lifts to reveal the iconic Diamond blue tone. Additional branding hits can be found along the tongue and heel tab, culminating into a fitting return to one of the most notable collaborations in sneaker culture. Surely the Canary Yellow will fly off shelves once they secure a much safer release location, but the Black and White iterations will be available as a much wider release at skateshops and retailers all over the globe on November 10th. If you’re looking to pick these up, stay tuned to the Where To Buy list below which will continue to update up until the release. 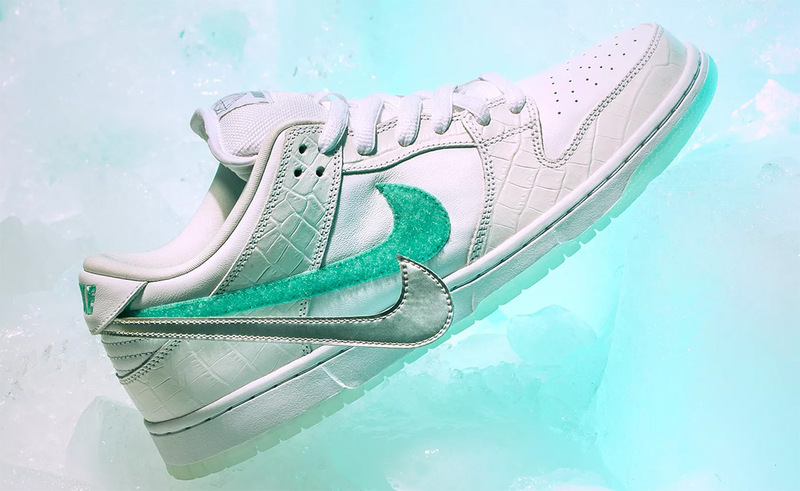 The post Where To Buy The Nike SB Diamond Dunks appeared first on Sneaker News.